As you can see, not the prettiest of code, but if you can understand cubescript at all you can figure out what this does. In a nutshell, the rightclick is bound so that you will pause the game and enter editmode: while in this state you can look around and choose where to put your portal. When you choose your spot, just left click and both a teleport and teledest will be placed, slightly offset from one another. The teleport and teledest already placed in the map will automatically link up, and bam, you have a woorking portal. I'm interested in seeing what people can do with this. It's far from elegant, so no cake for you, but I still think it could be fun: this map doesn't promote it, but this setup can be concievably used in DMSP. I suppose I should talk about the levels while I'm here. This zip contains three very simple levels, the first two being based off ones in Portal, the third being more oringinal: I chose the ones from Portal because they illustrate that portals are two-way, and also don't require any switches or anything. They are named portaltest (the original map), portal2 (because it was the second that I made), and portal3 (pattern much?). So first I'll comment on portaltest. If viewed from above, it looks like a big square U. The Start is in the topright of the U, the carrot (the end of the level) is at the topleft. The trick is that the level dips down, twice, so you have to first create a portal to the existing portal, and then create another from the original portal to the carrot. 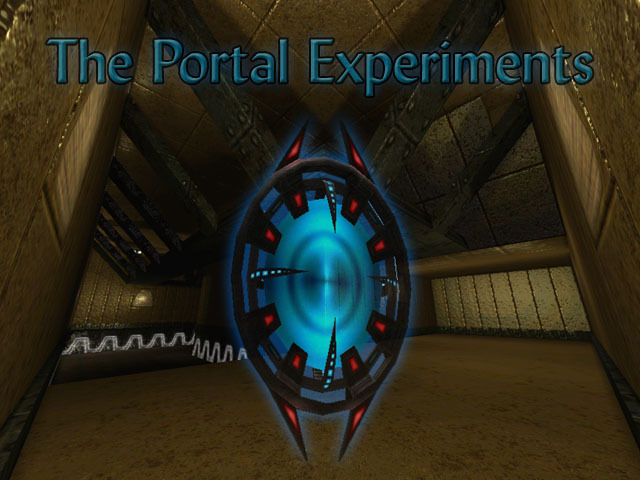 Portal2 is essentially the same thing. First you have to portal your way up to a platform, and then you have to portal your way to the other side of the door. In the original game Portal you had to bring a cube with you, but I haven't worked anything like that out yet. Portal3 is special because you get to place both portals. It is largely focused around forcing the player to get up on the ramp on the ceiling, which is surpisingly difficult (people just don't like looking up). One of my chief concerns with this level was that players were going to use their additional placement abilities to just skip to the end, so I made a meatgrinder chamber, as I call it. Fun times, it's very enjoyable to make these maps.